Engaging in an online course has traditionally been perceived to be a lonely experience, with students busy viewing video lectures, working on problem sets and interacting intermittently with others using asynchronous technologies. More recently, over the past 6 – 7 years, online courses have become recognized as viable delivery vehicles for online courses in Higher Education because they have made traditional pedagogical strategies available to large audiences through a heavy reliance primarily on asynchronous technologies. In contrast to this direction this paper outlines an approach to a fully online program that attempts to build community using a broad sampling of both synchronous and asynchronous technologies. The case study reported here is derived from a series of qualitatively analyzed discussions conducted by various stakeholders in the program. The major findings point to a reconceptualization of the way social and cognitive presence can play out in online learning. Online courses are known to be, for the most part, primarily instructor-driven, content centred and focussed on individual work. This is particularly true of many online courses that have been transitioned from traditional classrooms. These courses tend to be instructor driven environments, where the instructor, making most of the educational choices, is responsible for the delivery of the course content to the student and for modelling appropriate learning behaviours or as Hiltz and Turoff (2005) described “conveying to the student the cognitive maps that we [instructors] use for problem solving in a discipline” (p. 62). The emphasis of the instruction is on information organization and clarity of delivery. Students are required to focus on and meet the needs of the content or to master (memorize, comprehend and apply) the content, frequently with few supports (O’Neil & Sai, 2014). Since course content is preeminent, the course organization cannot be easily changed to meet the needs of either the instructor or the students. If the assigned tasks are to be addressed by multiple students, more complex problems are generally reduced to constituent parts and then assigned to specific individuals. Tricky problems may often end up relying on a single clever individual, operating alone. Using these processes, as reported by Lehman and Conceição (2014), results in high rates of students dropping out of online courses due to: “feelings of isolation, frustration, and disconnection; technology disruption; student failure to make contact with faculty; inadequate contact with students by faculty; lack of student and technology support; lack of instructor participation during class discussion; lack of clarity in instructional direction or expectation; and lack of social interaction” (p. xi). The Bachelor of Arts in Educational Studies and Digital Technology (ESDT) program at UOIT is an attempt to create a learning environment that is learner-driven and process-centred; an environment where teamwork is not only fostered, but required and where students in these types of environments are responsible for their own learning (Desjardins & vanOostveen, 2008). The ESDT program is structured on premises similar to those outlined by Smith (2003), where the emphasis at the course and program level is for educational choices to be made by the students as they work to build a deep understanding of the content and processes used for learning Within the ESDT program learning is defined comprehensively as including memorization, comprehension, application, analysis, synthesis, evaluation and creation, as well as actively occurring in the context of problem-based scenarios which emphasize the students’ abilities to perform tasks by producing collaborative work based on their knowledge and skills. Assignments and tasks are assessed in authentic ways that include observation of, and making judgments about, the students’ demonstration of skills or competency in creating products, constructing responses, or making presentations. Group work is collaborative, requiring the parties involved to jointly solve problems. This enables differing and possibly conflicting views to arise allowing for the creation of new and previously unimagined understandings/solutions (Eaves, 2007). The purpose of this research is to determine if it is possible to establish a viable community of practice, CoP, involving adult learners within the constraints of a fully online PBL learning environment. The community of practice should conform to the characteristics of a CoP, that is, members strongly identify themselves as members of the community and the practice is developed through the interactions of the members (Nickols, 2012). The ESDT program has a common course format that is articulated in 12 mandatory weekly modules. This common format is described in the following paragraphs. Students studied a series of YouTube-based video clips, designed as modified Problem Based Learning Objects (PBLOs), which presented contexts/situations. PBLOs are reusable, multimedia tools that are comprised of four templated ‘pages’ of information, including a video-based case study (vanOostveen, Desjardins, & Bullock, 2010). Each page has a specific purpose and function, are grounded in theories of social constructivism, communities of practice, and make use of problem based learning principles (vanOostveen, Desjardins, & Bullock, 2010). PBLOs are used throughout the ESDT program as a means providing students with contexts or scenarios which can be used to create problems and work towards solutions (vanOostveen, Childs, Flynn & Clarkson, 2014). Using the analysis and synthesis questions which were embedded in the PBLOs, students undertook to construct/create problems or questions which formed the basis of the student PBL investigations. The interrogation of the videos also provided the initial impetus for the discussion that occurred in the subsequent tutorial sessions. Following the viewing of the video clips, students met for 60 minutes of synchronous group activities (tutorials) using Adobe Connect. Tutorials provide opportunities for students to discuss the scenarios presented in the videos, to create problems/questions, to identify available and required knowledge/resources and discuss all of this with colleagues. Tutorial sessions were facilitated by instructors and/or teaching assistants. Tutorials required the use of webcams and headsets to allow for audio interaction, as well as the viewing of facial expressions and body language. Throughout the course, students continued their PBL investigations utilizing 60 minutes or more of collaborative work done online a/synchronously using tools such as blogs, wiki entries, and Google Drive. Typically, students worked in small groups of 3 or 4 in collaborative applications such as Google Drive while simultaneously conversing in Google Hangouts or Adobe Connect (vanOostveen, 2016). The Blackboard learning management system was used as a repository for course documents including the syllabus and presentation files used in the production of the YouTube videos. The ESDT program is oriented towards the inclusion of Inquiry-Based Learning (IBL) and Problem-Based Learning (PBL) in each course. Inquiry-Based Learning and the closely related Problem-Based Learning strategies derive, at least in part, from the 1960s Guided Discovery movement as a response to traditional pedagogical techniques that emphasize the memorization of information (Bok, 2006). Both IBL and PBL start with the interrogation of a situation or a context and then identify/create questions or problems, find resources and develop knowledge in order to either suggest answers or solutions to the questions/problems. IBL and PBL strategies used in the ESDT program assume a social constructivist philosophical stance, requiring the generation of concepts and derivation of meaning by individuals while engaging in discourse with others. According to the Centre for Excellence in Enquiry-Based Learning (2010), IBL “describes an environment in which learning is driven by a process of enquiry owned by the student. Starting with a ‘scenario’ and with the guidance of a facilitator, students identify their own issues and questions. They then examine the resources they need to research the topic, thereby acquiring the requisite knowledge” (para. X). Skills developed in IBL and PBL will then include question/problem finding or creating, as well as working towards answers/solutions. The products of IBL/PBL may include an application to a real-life situation; however, this is not required in all instances as the learners themselves may define the end product. new content knowledge, pedagogical techniques, approaches to assessment, and classroom management. Students are equally challenged, as these innovations change how they interact in classrooms. Inquiry learning requires them to collaborate with peers, think deeply about complex concepts, relate new science content to their lives inside and outside school, and self-regulate their behaviour and thinking across the weeks that an inquiry project might unfold (Marx, Blumenfeld, Krajcik, Fishman, Soloway, Geier & Tal, 2004). In the ESDT program, problem based learning has been defined as “a curriculum model designed around real life problems that are ill structured, open ended or ambiguous” (Fogarty, 1997) and is informed by the writing of Savin-Baden (2007) and Watts (1991). Fogarty also suggests that PBL engages students in intriguing, real and relevant intellectual inquiry and allows them to learn from these life situations” (1997, p. 2). Students in the ESDT program may work physically and temporally removed from each other, but they share the same virtual space working out what they need to learn to engage with the problem situation. The virtual space may use a shared whiteboard, video conferencing tool, email, a discussion board, Twitter or some combination of any or all of these. While the learners are distributed, it is through the use of a/synchronous collaboration tools such as chat, shared whiteboards, video conferencing, and group browsing allows for the co-creation of the learning environment by the learners and the facilitator/instructor. The co-created environments provide the space within which collaboration and the negotiation of meaning is cultivated (vanOostveen, Desjardins & Bullock, 2010). The ESDT program design philosophy is informed by the Online Pedagogy Model, OPM (Graduate Online Pedagogy Committee, 2014), which was adapted from the Community of Inquiry (CoI) model (Garrison, Anderson & Archer, 2000). OPM asserts that deep and meaningful learning within the program occurs at the intersection of two spheres: social presence and cognitive presence, all the while immersed within a digital space. 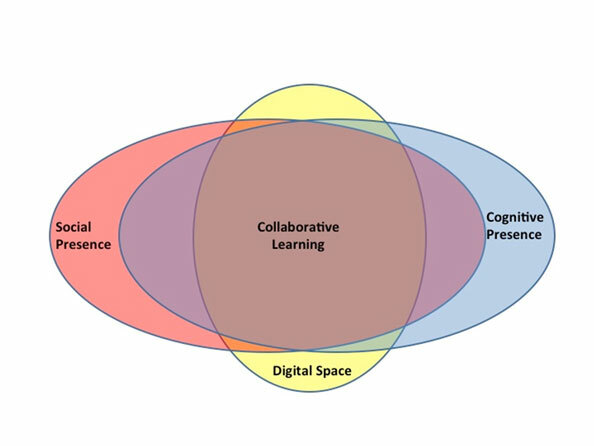 The digital space referenced in the model is described above as the co-created environment. This space is fluid in that while there are some prescribed components, many of the tools are left to the choosing of the students, making use of the newer Open Educational Resources that are constantly appearing. According to Anderson (2008), cognitive presence “supports the development and growth of critical thinking skills. Cognitive presence is grounded in and defined by the study of a particular content” (p. 344). In the ESDT program, cognitive presence is established by students creating questions/problems, seeking out relevant information and actively engaging in building their understandings while producing their solutions as preliminary conjectures or hypotheses. In a similar fashion to the Garrison, Anderson and Archer (2000) CoI model, the OPM used in the ESDT program defines social presence as the building of a collegial environment that invites and supports students so that they will feel free to share their ideas without fear. However, unlike the CoI model, students in the ESDT courses are encouraged to actively seek out critical refutations from their colleagues and use these refutations as constructive feedback in order to improve the quality of the thinking (vanOostveen, DiGiuseppe, Barber, Blayone and Childs, 2016). Each course member is given a primary responsibility to engage in critical discussions surrounding each problem. Unlike the CoI model, there is no “teacher presence” in the OPM. This aspect is omitted in order to attempt to produce a horizontally flat environment that is devoid of the power structures that are readily apparent in classrooms where there is a strict hierarchy. Each member of the class, regardless of position (student, instructor or teaching assistant) is viewed as a learner, each with valid past experiences, perceptions and responsibilities. This results in a space that is characterized as collaborative learning. This type of learning requires all parties involved in a project to work jointly towards solutions that will be co-owned by all since there is no division of labour and all decisions are reached through social negotiations, enabling differing and possibly conflicting views to merge resulting in the creation of new, complex and previously unimagined understandings/solutions to the originally presented contexts (Conrad & Donaldson, 2011; Eaves, 2007). The fluid nature of the interactions conducted during the tutorials, as well as the conversations in small groups working on tasks and assignments resulted in the development of a learning community (Lave & Wenger, 1991; Luppicini, 2007; Kowch & Schwier, 1997; Rheingold, 2012). A brief description of the work of one group is offered here in order to provide the reader with insights into how the students work and learn collaboratively. In an ESDT course, a group of students created a PBLO to examine the topic of technology and its impact on our lives. Page one of the PBLO oriented the learner to the ill-structured and complex topic through the use of a short video and supporting narrative as well as a series of analysis questions. Page two provided additional contextual detail and a curated list of resources and references for the learner to examine as they explored the topic. Page three provided a summary of some of the various perspectives and theoretical foundations on the topic. Page four provided a series of synthesis questions for further exploration and continued dialogue as well as the initial orienting video and brief narrative. The students worked fully online using a wide variety of multimedia tools to communicate with each other and to create the various elements. The remainder of the students in the class, who were simultaneously crafting their own PBLOs, and the facilitator/instructor supported and offered critical feedback at all stages along the way. The final step in the process was a community assessment of a presentation of the finished PBLO product. The case study method of inquiry was used in this research study as the phenomenon which was being investigated has multiple sources of evidence (Merriam, 1998, 2009; Yin, 2009) and occurred in a bounded system (Creswell, 2015). The research was conducted during spring semester 2014 and involved six participants: one student, two teaching assistants, one new faculty member, one experienced faculty member and the program director. Data was collected in six focus group sessions of 90 minutes in duration conducted across four months using the synchronous tool used in the ESDT program, Adobe Connect. Based on a review of the literature and the building from the OPM that underpins the ESDT program design philosophy, each focus group session was framed around an initial area for discussion. These included: (1) roles of various stakeholders; (2) course access methodologies and technologies; (3) design philosophy; (4) faculty experience; (5) student experience; and, (6) future considerations (Childs, vanOostveen, Flynn & Clarkson, 2015). Data sets were derived from transcripts of the synchronous recording and the chat and verified for accuracy of transcription by two research assistants. For this research study, data was initially themed and coded in nVivo by three researchers using the four main areas identified in the OPM: (1) social presence; (2) cognitive presence; (3) digital space and, (4) collaborative learning, as defined above. Secondary coding was done using the SAMR tiers of (1) redefinition, (2) modification, (3) augmentation and, (4) substitution (Puentedura, 2003) as adapted for the purposes of this study to the program level (Table 1). In order to examine the role of the ESDT program design philosophy, including access methodologies, on facilitating online community, the SAMR model (Puentedura, 2003) was used as a framework for data analysis. Since SAMR focuses on the use of technology it was necessary to modify the definitions to focus on the use of within the program. Table 1: Current and Modified Definitions of the SAMR Tiers (Childs, vanOostveen, Flynn & Clarkson, 2015). Substitution Tech acts as a direct tool substitute with no functional change Program acts as a direct tool substitute with no functional change The use of break out rooms in Adobe Connect as direct tool substitute for break out groups in a physically co-located program. It should be noted that the methodology described in this paper was that of a preliminary investigation into the establishment of a CoP within a fully online environment. Three members of the stakeholders group developed and subsequently implemented a coding scheme based on the OPM and SAMR models. The methodology included coding by individuals, member checking, and recoding based the consensual definitions that were derived during member checking. It is interesting to note that despite rigorous attention to these processes, there were still large discrepancies between the coders. For instance, in the intersection of Cognitive Presence and Redefinition, individual coding scores of 15, 9 and 17 were recorded, producing the mean of 13.7. The variation between these values illustrates that the researchers will need to revisit the coding schemes using additional member checking processes in order to ensure the validity and reliability of the results. Until this work is undertaken, the findings and conclusions reported in this paper should be viewed as tentative, although they tend to agree with student derived anecdotal comments that have been gathered by the research team. The collated results are presented in Table 2 as an average (mean) for each category. Table 2 depicts the average frequencies derived from the intersection of the ESDT OPM and the modified SAMR tiers based on the collated data from three members of the research team. It seems possible that the relatively high frequency of cognitive presence on the redefinition tier indicates that the level of critical thinking done by course members in the program allowed for the creation of new tasks that were previously inconceivable. The following quote points to the role of IBL/PBL in instigating reflection and critical discourse. It is surprising to note that the digital environment received the least recognition with the data set. Initially, the digital tools seemed to have contributed some anxiety which might have been somewhat alleviated through the implementation of some support structures, as illustrated in the following quotation. However, perhaps as a consequence of the lack of these specific support structures within the IBL/PBL orientation, a community began to coalesce to offer assistance to the members of the community as they began to ‘figure it out for themselves’. think[ing] back to the very first group coming through around the technology because it was so frustrating for many and there were so many different types of technology (WebKF, Dropbox, Skype, Adobe Connect, UOIT email) … a real community started to form just around “can you help me figure this out (Participant 3, 2014). There are relatively high indicators for social presence across the tiers, rising considerably in the Transformation section of the model. This suggests that while there is comfort and security in being supported, the real gains are made when students are being challenged about their preconceived notions, allowing for redefinition of the concepts and processes involved. the communication piece has been great because there is a very, very level playing field that I feel within the entire course, but specifically between me and the faculty members where they try to ensure that they don’t have – they both say that they have big personalities, so they have been making sure they don’t overshadow me which has been great too because it can be really ensure that we are on the same level (Participant 5, 2014). This quotation from the intersection of social presence and the modification tier illustrates the effect of removing the hierarchical structures of power and control and giving the student the freedom to make decisions about and for their own learning. When students are challenged to become accountable for their learning, it is likely that they will begin to grow in ways that go far beyond what is possible in traditional environments. The sandbox reference in the following quote comes from a reference to Seymour Papert who developed a high-level computer language for use by children as a mathematical sandbox in which children would play with the language by coding and consequently would learn about mathematical concepts. Think [about] defining responsibilities to yourself, to the assignment, to each other, establishing those - whatever you want to call them, guidelines, ground rules, how you are going to play in the sandbox, and get something done (Participant 3, 2014). The use of PBL methodologies in the ESDT program, as an integral part of the program design, necessitates that students work in collaborative ways with each other, negotiating process and meaning at each step of the way. It is interesting to note that in this initial analysis of the data that there seems to be Enhancement (Substitution and Augmentation) as well as Transformation (Modification and Redefinition) across all components of the ESDT program model. The ESDT OPM, affordances of technology, and PBL methodologies seem to appear to allow for enhancement and transformation of the ways in which participants conceive of creating and interacting with the resulting online community. This concept is anecdotally supported by numerous students’ comments to the effect that strong interpersonal relationships have been established between individuals in the program, i.e., they became close to each other. With an eye to future research in this topic area, this research team is embarking on a detailed study of online community development within online programs like the ESDT. A detailed reanalysis of the present data set is scheduled to take place in the next few months and the team will be working on identifying the essential characteristics of viable online communities with an eye to developing a set of criteria that might be applied to online environments as a predictor of community development and student engagement. In addition, other projects are underway looking at the interaction effects of PBL and digital technology competencies. It is conjectured that all of these studies will allow for greater insight regarding what membership within an online learning community entails and how individuals within these communities can make use of the digital affordances that make up the online environment for learning purposes. Bok, D. (2006). Our underachieving colleges: A candid look at how much students learn and why they should be learning more. Princeton, NJ: Princeton University Press. Childs, E., vanOostveen, R., Flynn, K. & Clarkson, J. (2015). Community building in online PBL courses: Instigating criticality. A full paper presentation for the Higher Education in Transformation Symposium, March 30 – April 1, 2015, Dublin, Ireland. Conrad, R-M. & Donaldson, J.A. (2011). Engaging the Online Learner: Activities and Resources for Creative Instruction. New York: Wiley & Sons. Creswell, J. W. (2015). Research design: Qualitative, quantitative, and mixed methods approaches. Johanneshov: MTM. Desjardins, F. & vanOostveen, R. (2008). Collaborative Online Learning Environment: from PBL theory to working prototype. A presentation at the 1st Annual conference for the Canadian Network for Innovation in Education (CNIE), April 27-30, 2008, Banff, AB. Fogarty, R. (1997). Problem Based Learning and Other Curriculum Models for the Multiple Intelligences Classroom. Australia. Hawker Brownlow Education. Garrison, D.R., Anderson, T., & Archer, W. (2000). Critical inquiry in text based environment: Computer conferencing in higher education. The Internet and Higher Education, 2(2–3), 87–105. Graduate Online Pedagogy Committee. (2014). Online Pedagogy Model, version 4. Unpublished. Hiltz, S.R. & Turoff, M. (2005) Education goes digital: The evolution of online learning and the revolution in higher education. Communications of the ACM 48(10). Kowch, E. & Schwier, R. (1997). Building Learning Communities with Technology. A paper presented at the National Congress on Rural Education (2nd, Saskatoon, Saskatchewan, Canada, February 21, 1997). Luppicini, R. (2007). Online Learning Communities (Ed.). Greenwich: Information Age Publishing. Marx, R.W., Blumenfeld, P.C., Krajcik, J.S., Fishman, B., Soloway, E. Geier, R., & Tal, R.T., (2004). Inquiry-based science in the middle grades: Assessment of learning in urban systemic reform. Journal of Research in Science Teaching. 41, 1063-1080. Merriam, S. B. (1998). Qualitative Research and Case Study Applications in Education. Revised and Expanded from “Case Study Research in Education”. Jossey-Bass: San Francisco, CA. Merriam, S. (2009). Qualitative research: a guide to design and implementation. San Francisco, USA: John Wiley and Sons. O’Neill, D.K. & Sai, T.H. (2014). Why not? Examining college students’ reasons for avoiding an online course. Higher Education 68:1-14. Rheingold, H. (2012). Net smart. Cambridge, MA: MIT Press. Savin-Baden, M. (2007). A practical guide to problem-based learning online. New York: Routledge. vanOostveen, R. (2016). Bachelor of Arts in Educational Studies and Digital Technology Handbook, Version 4. Unpublished. Oshawa, ON: University of Ontario Institute of Technology. vanOostveen, R., Childs, E., Flynn, K. & Clarkson, J. (2014, July). Integration of PBL methodologies into online learning course and programs. A full paper presentation for the IADIS e-Learning 2014 Conference, July 15-18, 2014, Lisbon, Portugal. vanOostveen, R., DiGiuseppe, M., Barber, W., Blayone, T. & Childs, E. (2016, July). New conceptions for digital technology sandboxes: Developing a Fully Online Learning Communities (FOLC) model. In Proceedings of EdMedia: World Conference on Educational Media and Technology 2016 (pp. 672-680). Association for the Advancement of Computing in Education (AACE), June 29, 2016, Vancouver, B.C. Watts, M. (1991). The science of problem solving: A practical guide for science teachers. Portsmouth: Heinemann Education Books. Yin, R. K. (2009). How to do better case studies. In L. Bickman & D. J. Rog (Eds. ), The SAGE handbook of applied social research methods (pp 254-282). Thousand Oaks, CA: Sage Publications, Inc.